Adaptec is putting out a series of SAS12 cards today and adding a few features as well. Welcome to the new 8-Series SAS RAID cards and the MaxCache Plus software that goes with it. 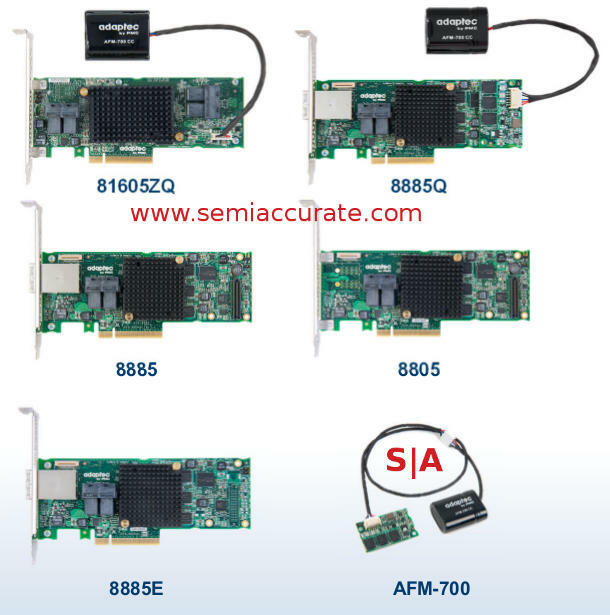 There are five new PCIe3 8x cards all based on the PMC PM8063 RoC ASIC called the 81605ZQ, 8885Q, 8885, 8805, and 8805E. The naming convention goes like this, the first digit is the series, 8 in this case, the second digit (or two in the 81605ZQ) is the internal port count, third digit is the external port count, and all end in 5 to celebrate something we are not aware of but are really happy that it exists, we think. That means all but the 8805 have 16 miniSAS ports and the entire lineup looks like this. Things get interesting when you look at the flash backup and attendant supercaps to power it in case of a datacenter power ‘event’ known to the more tech oriented as a ‘whoopsie’. This used to be a large external module like the AFM-700 at the bottom, a super-wide flash card coupled to a power source. Both the 81605ZQ and the 8885Q have the external power module to keep the cache alive but only the 81605ZQ has the flash to back it up on board. Putting all that on the card meant to fit in a 1U server is an impressive packaging feat. If you want the same functionality on one of the other non-Q/ZQ cards you can add the optional AFM-700 module. The only oddball card is the lowest end part, the 8885E. This is a ‘value’ SAS12 card if such a thing exists in the server SAS space. To start with this one has 512MB of DRAM instead of the 1024MB on all the others and some features are not present. From the look of the pictures the AFM-700 connector is also absent but if you are value shopping for RAID cards you probably are not worried about flash and supercaps anyway. On the software side the MaxCache software of old gets a rather comprehensive update. Like its predecessors the new Plus allows you to use an SSD or flash as a cache or accelerator for your RAID volumes. In the new version you can assign tiers to storage somewhat arbitrarily and use storage that is not directly connected to the card. In essence it evolves from a cache manager to a system storage manager, a massive change. While the admin only sees a little added functionality, the plumbing Adaptec put in to place is substantial.